General Hospital spoilers tease that Sonny (Maurice Benard) is in for some tense moments ahead. He’s been doing everything possible to keep Julian (William deVry) from starting the renovations at Charlie’s Pub. There’s a big secret hidden in the foundation at the pub – a body and a gun that could incriminate Sonny – and Sonny doesn’t want it found. But events are going to transpire that might just accidentally unearth the body and gun. GH spoilers say that Mike (Max Gail) will get set out to get rid of the incriminating evidence by blowing up the pub. He’ll figure that if the pub explodes, the evidence will be destroyed and Sonny won’t have to worry about it any longer. So, Mike will sneakily take a wrench to the pub’s gas line. Unfortunately, his actions will have some unintended consequences. First off, Kristina (Lexi Ainsworth) will spot Mike with the wrench after the smell of natural gas fills the pub, and she’ll decide to fix the leak while others are rushing out of the pub. But will Kristina succumb to the gas and lose consciousness? That’s a big risk. 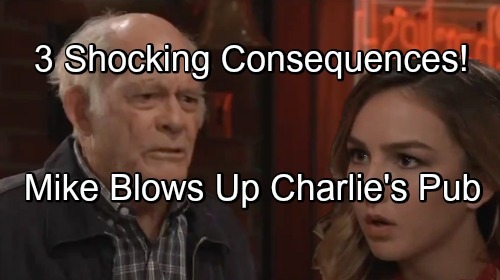 And General Hospital spoilers say that there will be an explosion at the pub – will Kristina be rescued before she’s caught in the blast? It will be a scary scene for sure. Of course, another unintended consequence of Mike’s actions will be that the explosion will draw the police to the scene. There will certainly be a thorough investigation of how the accident occurred, and this might result in the body and gun being found! But will the explosion destroy any physical trace evidence that might link Sonny to the body and gun? And the final unintended consequence of Mike’s actions may be that Sonny finally has to put Mike in a memory care facility. Mike may be deemed a danger to others after this incident, and/or there may be legal ramifications for what he did, if the police figure out that Mike tampered with the gas line. And Mike may be forced to admit (if he remembers) why he wanted the pub destroyed. Do you think that the pub explosion will bring Sonny’s past crime to light? Stay tuned to the ABC soap and don’t forget to check CDL often for the latest General Hospital spoilers, updates, and news. General Hospital Spoilers: Cornered Peter Takes Sam Hostage – Maxie Helps Jason with Desperate Rescue?